Portland, Maine Chef’s Table Cookbook Has Arrived! 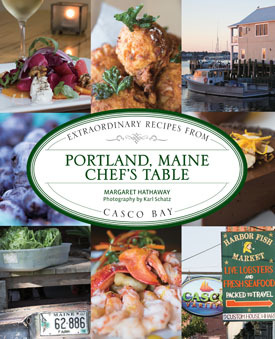 Our new book, Portland, Maine Chef’s Table: Extraordinary Recipes From Casco Bay, written by Margaret and photographed by Karl, has finally arrived (a little earlier than expected)! We’ve heard that the book has already been spotted in at least one bookstore around town (Longfellow Books), is available to order on Amazon.com (ships August 9), and it’s available for sale (signed!) from our very own Ten Apple Farm site. The book looks beautiful, and we are really really pleased with how it turned out. It’s a great representation of the wonderful food and restaurants that Portland has to offer. The cookbook gathers Portland’s best chefs and restaurants under one roof, featuring recipes for the home cook from 48 of the city’s most celebrated restaurants and showcasing full-color photos of mouth-watering dishes, award-winning chefs, and lots of local flavor. We’ve begun to plan some events around the launch of the book, and there are a couple of dates that we can announce already that you can mark on your calendars. On Wednesday, September 5, at the Portland Museum of Art, we’ll be having a grand book launch party, complete with book signing, tastes of some of the recipes from the book, appearances by chefs, and some surprises as well, I’m sure. On August 30 we’ll be doing a book signing at Cultivating Community’s Twilight Dinner where Chefs Brad Messier & Erin Lynch of Rosemont Market & Bakery will be serving up a delicious feast. Tickets for the dinner are available at Cultivating Community website. Stayed tuned for more events, including some special restaurant book signings and dinners to be announced soon!